The Mizuno Wave Lightning Z4 redesigned Mizuno Wave Lightning series men’s volleyball shoes features a familiar and secure, comfortable fit with quick movement support and performance grip. Many of Mizuno’s innovative shoe technologies have been seamlessly integrated together into the Wave Lightning Z4. The Wave Lightning Z4 Men’s volleyball shoes are available in a wide range of sizes from 7 up to 17. On amazon.com and mizuno.com, colors are limited to BLACK-SILVER and STARS & STRIPES pictured below. However, zappos.com also lists WHITE-BLACK and GREY options for the Z4 as pictured below. Of all the online retailers that offer the Mizuno Wave Lightning Z4 volleyball shoes, amazon.com has the most current verified buyer reviews. Almost every amazon.com review for the Z4 is a five star rating. The pros and cons overview below summarizes most of the opinions expressed in the reviews. Good build quality, lightness, comfort and correct sizing is mentioned by nearly every reviewer. One reviewer uses the Z4 for racquetball while another uses the Z4 for video based fitness classes. Both reviewers express the same positive experience as the volleyball player reviews. The only non-five star reviews consisted of a volleyball player whose Z4 tore on the side after only using them twice and one reviewer who posted only the word “small” for their review. Lack of shock absorption was also a noted issue. On a positive note, the reviewer with the torn Z4 did acknowledge that the Z4 volleyball shoes were comfortable even for wider feet and had good traction. One five star reviewer mentioned disappointment with only having two color options. The Mizuno Wave Lightning Z4 utilizes and brings together a good number of Mizuno’s innovative shoe technologies to deliver a durable, light-weight and protective high performing shoe. The Z4 is a great option not only for volleyball players but for anyone engaged in active lifestyle activities. The Z4 is available for purchase directly through Mizuno’s online store or through several established online retailers like Eastbay, Zappos, 6PM and amazon.com. Price ranges from $119 up to $160. 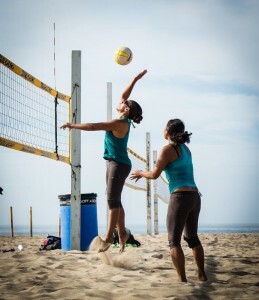 Volleyball Essentials recommends amazon.com or zappos.com. Both online retailers offer competitive pricing, sizing selection, free shipping and easy returns.